Mr Weezee Satay started humbly in Perth WA in 2000, with a small number of loyal customers. Today our Weezee sticks are synonymous with many family BBQs in WA to as far as the Eastern states. Like many fine establishments we are listed in the Food Lover’s Guide To Perth. We are conveniently located at Chelsea Village in Nedlands, Booragoon and in Canning Vale. We are also planning to open more outlets in the near future. 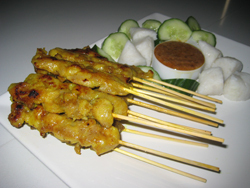 Mr Weezee Satay is served in a number of top end restaurants and by many well known catering companies in Perth. The patronage of these commercial establishments is testimony to the taste and quality of our satay. We use only fresh chicken and tender beef cuts to make our satay. Besides being gluten free, we do not use MSG, preservative or any other food additives in the satay. Our satay is processed in a clean commercially approved kitchen routinely monitored by health and food safe authorities. Feel free to contact our staff at our 3 outlets for orders or more details. Thank you for visiting us.